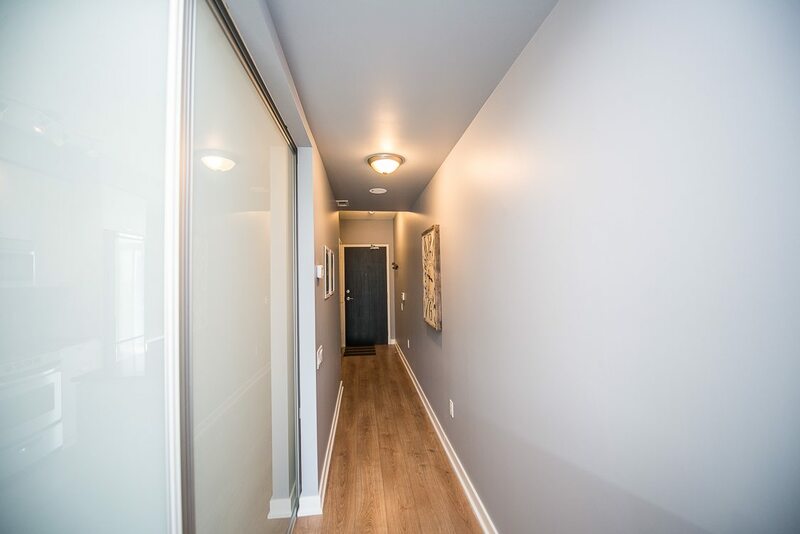 Open the door to this 1 bedroom Toronto living space located near the corner of King and Bathurst and fall in love with its tasteful contemporary decor and inviting nature. 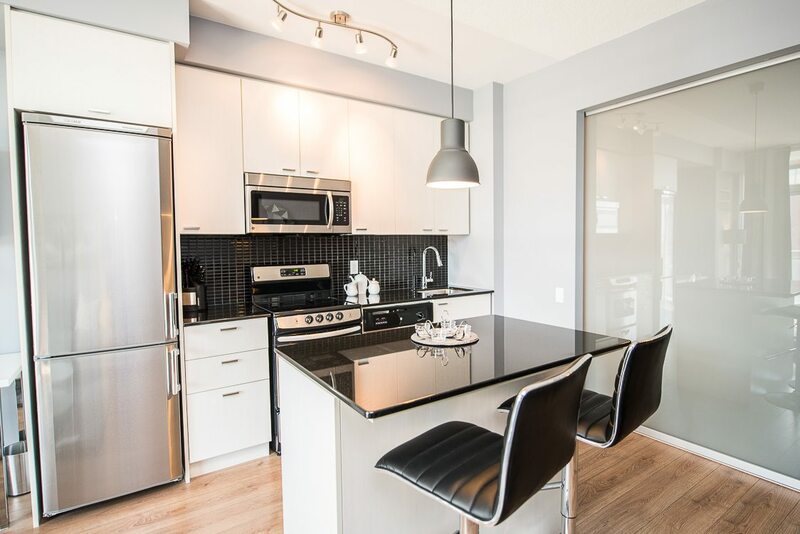 The kitchen stands out as one of this unit’s key features with its stainless steel ENERGYSTAR appliances, including a full-sized fridge, stove, sink, and microwave. Stone countertops and light brown wood flooring handsomely accent this attractive Toronto furnished living space. 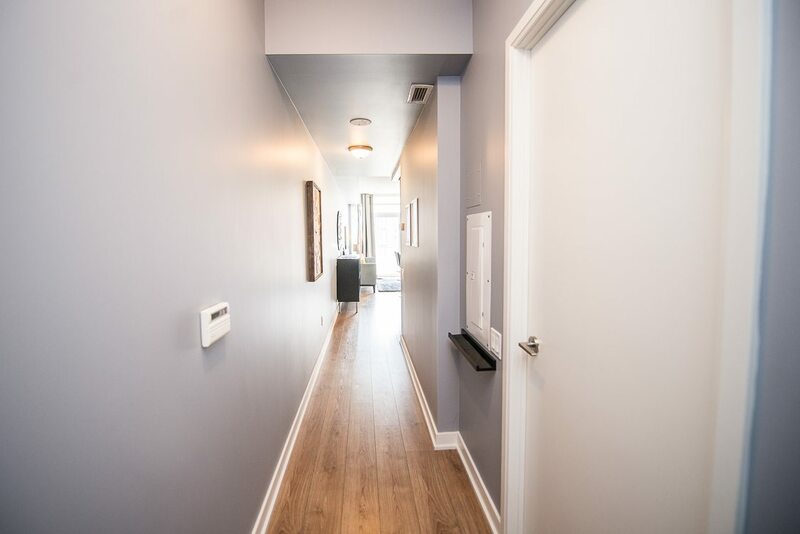 It will make you want to stay in and enjoy the many amenities it has to offer. It would work wonders as a host location for entertaining, whether that be with business associates, traveling companions, or simply catching up with an old friend. 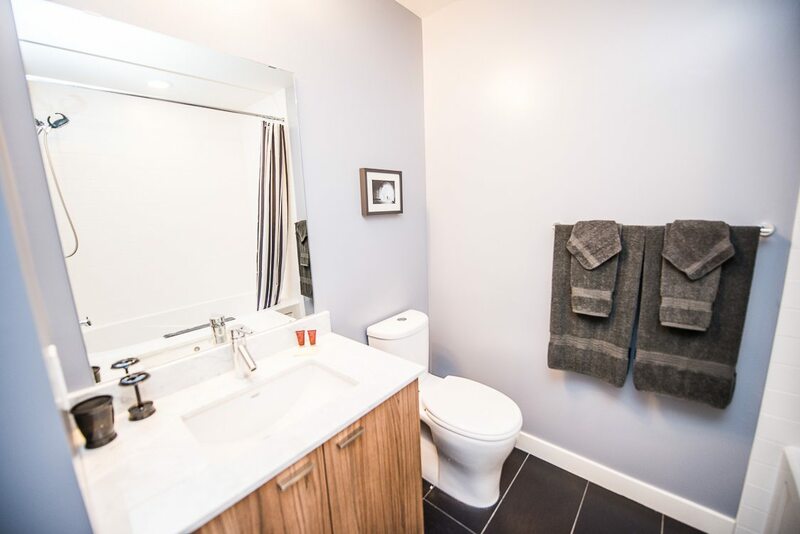 The bathroom washes over you in a collaboration of blues and whites. The dark tiled floor contour brilliantly against the porcelain white sink and toilet. 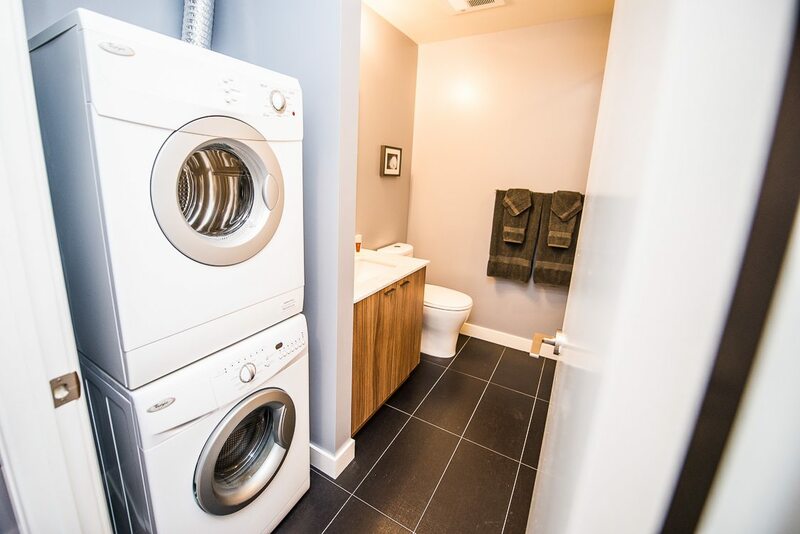 This spotless and alluring space is complete with a full bath and set of fresh linen towels. 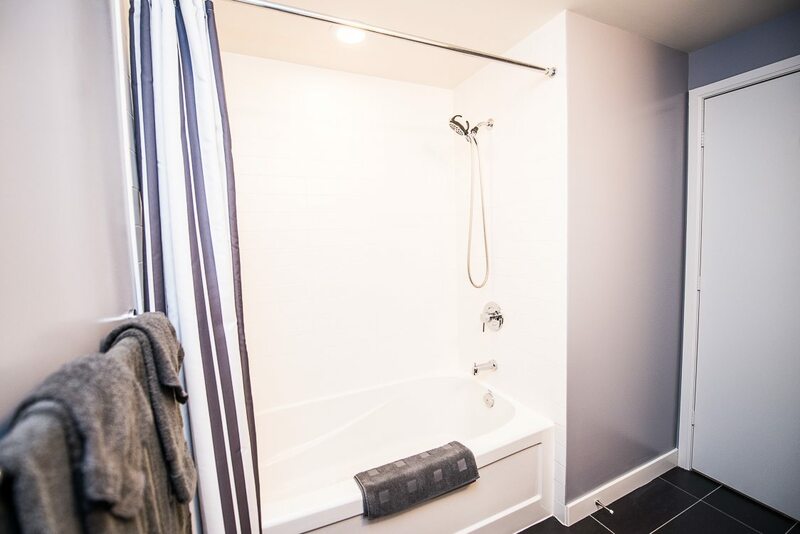 Let yourself shed the layers the day has placed upon your shoulders in this delightful powder room. 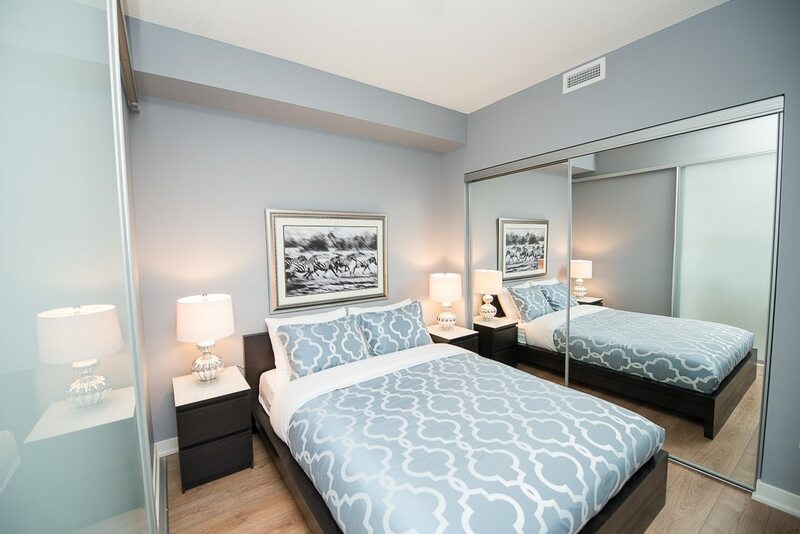 This 540 square ft. Toronto furnished rental offers a large and well-lit bedroom. The room greets you in pallor’s of blue and brown and is complemented by two symmetrically placed nightstands, and a large slide away closet. Steal yourself away to this night-time retreat and restore your body and mind whole-heartedly. The balcony is another asset to this unit. It provides guests with the opportunity to get some fresh air and also take in the incredible view. Take a peak at the Toronto skyline and even Lake Ontario in the distance, it’s not every day you get to experience the world from that point of view. 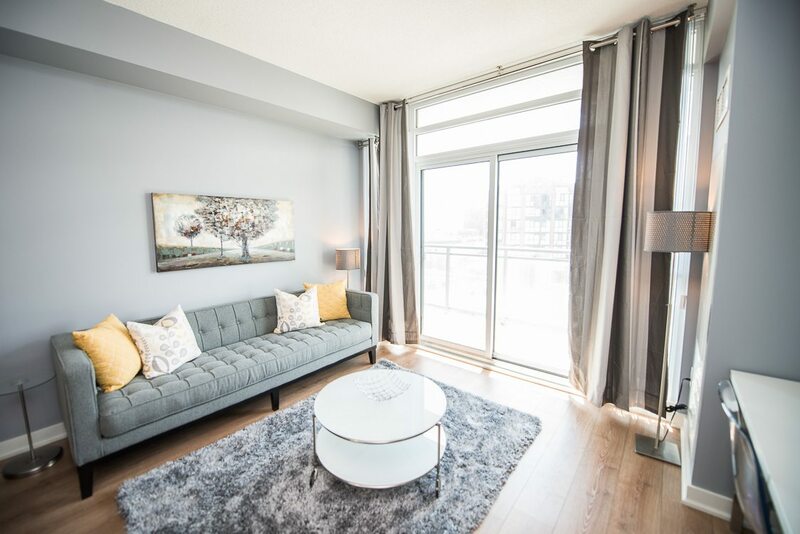 Furnished rentals Toronto are a fantastic alternative to hotels in many ways but the most notable are that they are more cost effective. You get more bang for your buck if you will. 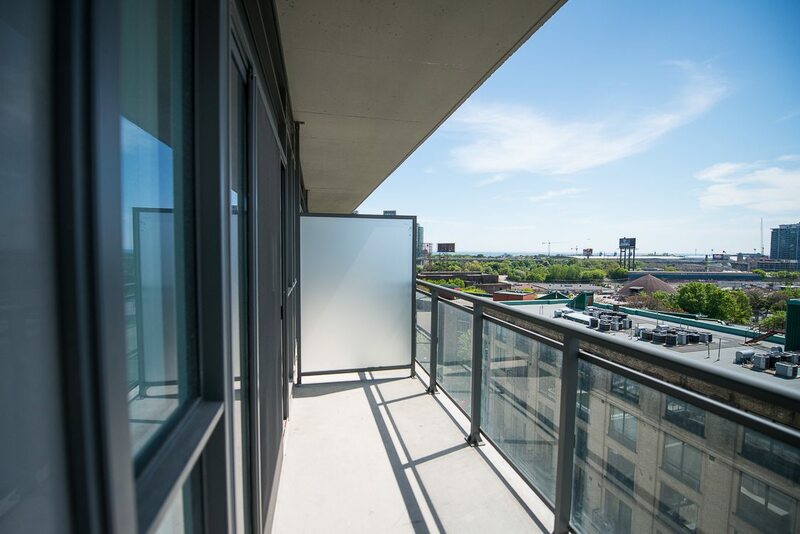 Sky View offers many other 1- bedroom furnished apartments in Toronto that are in the same neighbourhood as King West B. It is their mission to provide guests with the best possible accommodations in the best locations. The King West neighbourhood is screaming with entertainment. 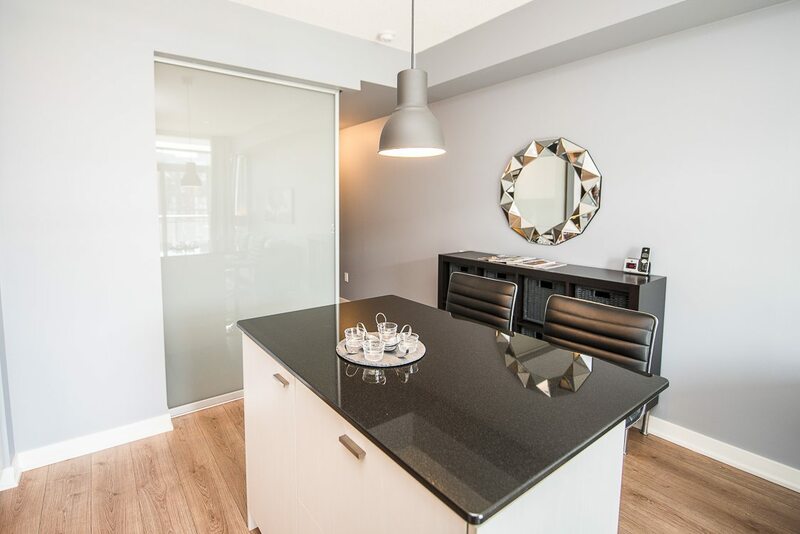 The King West suite offers guests an extended Toronto stay, making it easier for guests to enjoy anything from shopping to restaurants to night clubs. 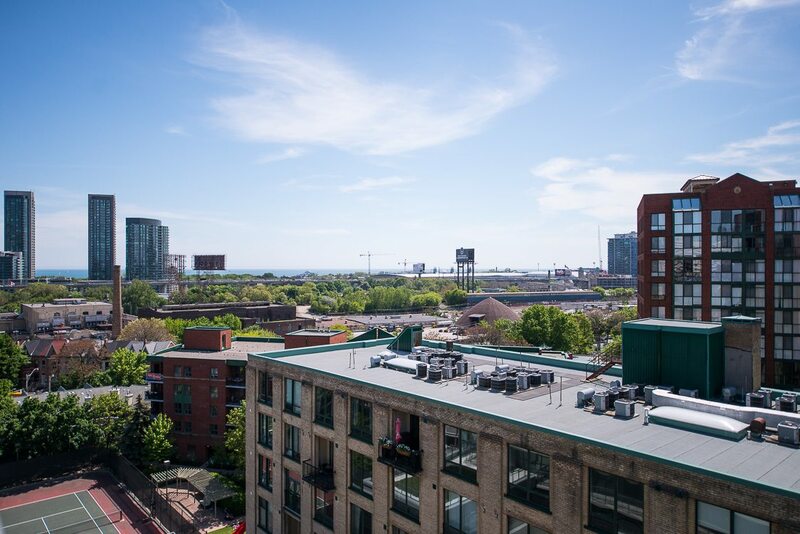 It is one of the fastest growing areas in downtown Toronto. In the fall it is home to Toronto’s infamous international film festival bringing an extra surge of enigmatic energy to the area. The neighbourhood caters to the young, stylish and professional. 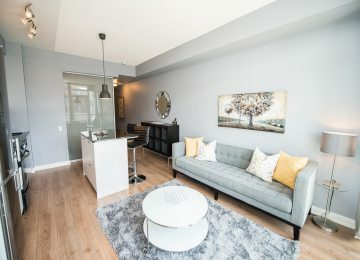 The surge and demand for condos have been met in this area in a truly unique way. The same buildings that house a number of Toronto hotspots are reclaimed industrial buildings, that are home to vast commercial offices on the upper floors. It’s the best way to mix work and play and make the most out of the space provided. If you’re looking for some fine cuisine King West has an unlimited amount of tasty options. Check out Buca for some rustic Italian, Lee for some inventive Asian plates, or the Cibo the wine bar to quench your thirst. 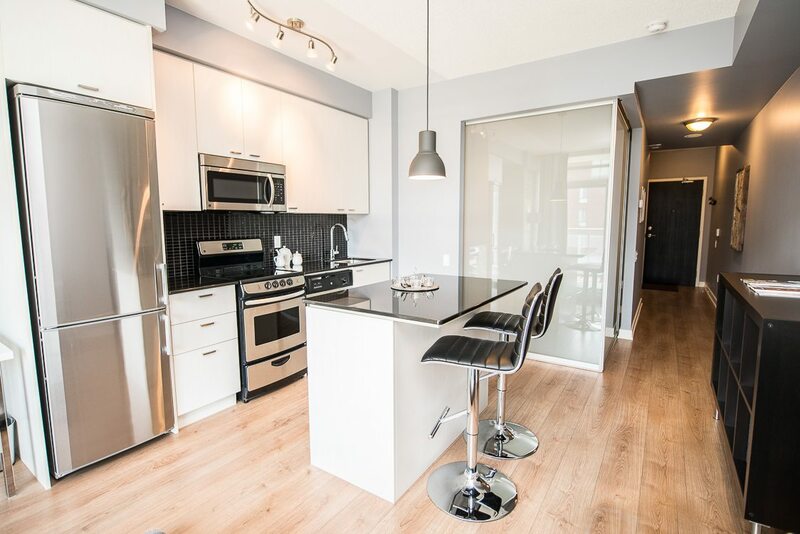 Besides a completely divine location, the host building of this 1-bedroomToronto furnished condo has a lot to offer in itself. 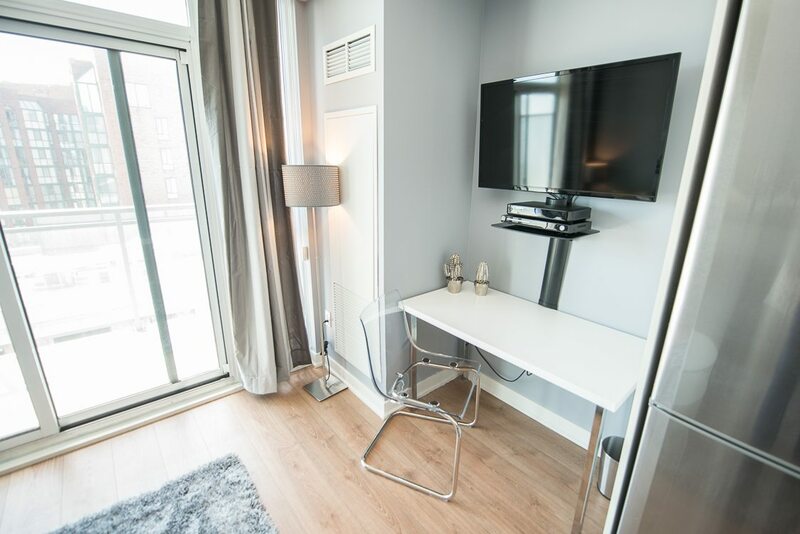 Should you find yourself not in the mood to take on the town, this ordinate suite will keep you completely satisfied. The building is set to take care of its inhabitants with a beautiful outdoor courtyard, and a fully equipped fitness facility. It creates the most tranquil and healthy atmosphere for its distinguished guests. 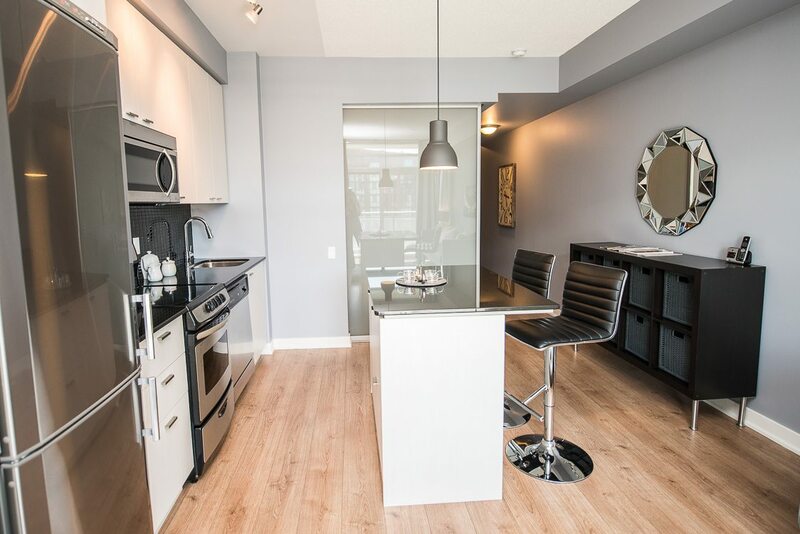 Sky View Suites rents these fully furnished apartments for rent in Toronto in order to provide their clients with a whole other level of benefits in comparison to traditional hotels.